Food Wars! : Shokugeki no Soma Vol. 26 Review – AiPT! An intense culinary showdown unfolds. Out of all the titles currently published in Weekly Shonen Jump, Food Wars! : Shokugeki no Soma is one of the most amusingly offbeat. It features all the high drama and explosive energy of its contemporaries, but none of that pertains to actual physical violence. Instead, the characters face off in cooking matches to test their mettle in the kitchen. The series’s twenty-sixth volume, published by Viz Media, is by Yuto Tsukada (writer), Shun Saeki (artist), and Yuki Morisaki (contributor). It features chapters 218-226, which depict the second bout of a group cooking tournament. The participants technically face off in one-on-one matches, but they are also allowed to spend some of their time assisting teammates with their recipes–if they think that’s a wise use of time. This volume is certainly intense–but is it good? As out there as the plot of this volume is, I love it. The tournament is a lot of fun, and it provides ample room for engaging competition, detailed discussions of flavors in food, and over-the-top backstories pertaining to why the characters take cooking so seriously. One charmingly flamboyant character has such devotion to the art of making ramen that he’s become known as the Ramen Master despite still being a high school student. Another brings a live alligator to her match, which she grabs and points toward her opponent in a show of intimidating confidence. The actual cooking is exciting as well, as we get to see what unusual recipes the young chefs come up with when tasked with crafting their dishes around specific ingredients. This volume is also strong art-wise. Every aspect of Saeki’s work is bursting with energy, from the page compositions to characters’ expressions to the overall flow of movement across panels. Not to mention, of course, the actual food. Reading Food Wars! makes me physically hungry, which is about as ringing of an endorsement as I can give it. The different ingredients all have unique and convincing textures on the page. As a result, you’ll really zone in on each one and salivate over how its inclusion affects the dish as a whole. I have very few qualms with this book. There are some rare clarity issues which mostly occur when shifts between scenes aren’t implemented smoothly. This only happens a few times throughout and the resultant confusion is always brief. Besides that, there is very little wrong with this volume. 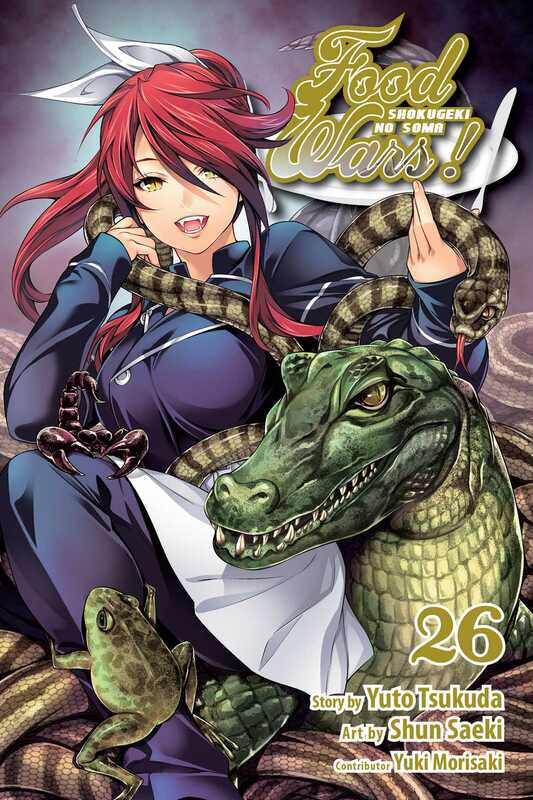 Readers who prefer poignant, character driven drama may not find this series especially appealing, but Food Wars! clearly isn’t meant to scratch that sort of itch. Overall, Food Wars! : Shokugeki no Soma Vol. 26 is a great read. The plot, characters, and culinary matches are all a ton of fun. The story itself is set up in such a way that Saeki can show off all the strongest parts of his artistic skill set. This harmony between the manga’s writing and visuals is a joy to behold, as it makes the act of cooking thrilling. There are some occasional clarity issues, and readers seeking a deep, poignant read would be better off trying a different series. With that said, if extremely off the wall fun with cooking sounds good to you then you can’t go wrong with Food Wars! With charming subject matter and perfect congruence between its artwork and writing, this volume is full of charming and eccentric fun.